Major Hugh Taffy Williams, a great Biafran hero was born in Glamorgan, Wales, United Kingdom in the year 1933 and died twenty-two years ago, in 1996. He grew up in South Africa and had his military training there. Hugh was a soldier of fortune who served as a major in Biafra and in Congo with Mike Hoare and fifth commando, Congo. Maj. Hugh served with the 4th Biafran Commando, Brigade during the war. It was a special guerrilla unit. In August 1968, Nigerian army set up positions along Aba-Umuahia road and cut-off all food supplies from the city. Adekunle had planned to starve Aba into submission and surround her. On 24th, two Nigerian battalion and their Soviet advisers crossed the Imo River bridge heading towards Owerri but the Biafran 4th Commando went against them head first. For three days, light machine gun and repeater rifle fire never stopped until they ran out of ammunition and retreated to Aba. Taffy participated in the operation DAV which took place between 2nd September to 15th October 1968, the Biafran Army were outnumbered and there were 25,000 deaths on both sides but Biafrans won and retained control of Umuahia, recapturing Aba and Owerri as well. Taffy was also at hand in the failed effort to recover Onitsha from the Nigerian army in the Operation Hiroshima. 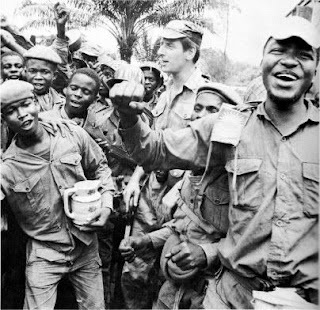 4,000 Biafran 4th Commando Brigade, in November 1968, moved from Umuahia to Nkwelle, Onitsha. Taffy ordered a unit under Marc Gossens to attack a Nigerian defence position but they were forced back after Belgian Gossens was shot dead. On 29th November, 2,000 soldiers of the Brigade retreated from Onitsha. Maj. Taffy Williams replaced Col. Rolf Steiner. Col. Steiner became paranoid after the Onitsha defeat, he began to drink heavily. Eventually, he was deported to Gabon due to his unremorseful attitude. Taffy Williams had been assigned to the 4th Commando Brigade led by Lt. Col Rolf Steiner after completing his first contract and a brief stay in the UK, he then returned to Biafra in July 1968. On August 24, 1968, Taffy was drawn to baule. He had 1000 soldiers under his command to carry out a counter-offensive against two battalions sized enemy units who were attempting to cross the Imo River Bridge with their Soviet Military advisers. Taffy Williams was noted for his bravery under fire. He served two tours of duty with the Biafran army, rising to the rank of a major. In his attempt to stop the two battalions crossing the bridge, he ran out of arms and returned to Aba for additional ammunition but was disappointed; the Nigerian Airforce had blocked supplies into the state. He was forced to withdraw with his men. As we celebrate these heroes, I hope that there are just and upright foreigners still living. Men of valour and truth to help propel this worthy Biafran fight for freedom. Taffy liked joking and he claimed to be half mad. He personally used to lead his troop in warfare. Atimes, he had stood the hail of federal gunfire and these unnerved the Nigerian soldiers. Early 1968, he was assigned 100 Biafran fighters and with them, he kept the two battalions of Chadian mercenaries serving Nigeria at bay for twelve weeks, with only antiquated weapons. He had said, "I have seen a lot of Africans at war but there's nobody to touch these people. Give me 10,000 Biafrans for six months and we'll build an army that would be invincible on this continent. I have seen men die in war who would have won the victory." Kudos to this brave English soldier, the last white mercenary to leave the country shortly before the war ended. Taffy Williams is worth our emulation, he fought till the end and never betrayed, nor sabotaged the Biafran people. We need men like him to move the agitation, countering all odds and fearlessly unnerving all oppositions. Can we come forth?